An ornate piece to enhance any Pirate themed area, our Pirates Treasure Chest has detailed carved squids all over the outside of the chest. This replica model Treasure Chest looks great with our other Pirate theming props and figures. This fantastic Treasure Chest lid fully opens to leave an empty chest for you to fill with Pirate booty from pearls, gold, jewels or as we have at present have it filled with replica weapons. 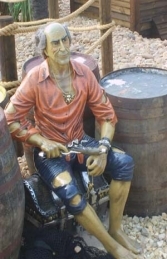 A superbly detailed and very striking pirate theme model will enhance any Pirate themed area.